"Important matters?!" muttered Rodrick after Lady Scarlet had disappeared into her study. "Just because she saved Ethyl from being hanged, drawn and quartered, this woman acts like we owe her some kind of favour." "Er ... I really don't think they were going to do all those things." opined Jacobson. "Who knows what these deluded crackpots are capable of." Seth added nodding suggestively towards the study door. "It's just that, if past experience is anything to go by, they'd have been far more likely put Ethyl in a ducking stool rather than drawing her." Jacobson continued undeterred. "I just can't see any point to doing a sketch of her." Rodrick didn't know whether to laugh at Jacobson's last remark or pity him for his lack of education. He decided to fill the old chap in on the subject. "'Drawing'" he explained. "doesn't mean the same as 'sketching' in this case my good man." Jacobson looked interested so Rodrick continued. "No. It means, after they've hanged someone 'til they're nearly dead, they take the body down from the gibbet and, using a sharp knife, they dissem ..."
"Enough of the history lesson already!!" Ethyl interrupted. She glowered her disapproval at Rodrick then continued. "I for one think we should at least hear what it is that Lady Scarlet wishes to discuss." Rodrick suspected something he had said might have upset Ethyl so he remained silent. Ethyl walked boldly over to the door of the study and entered. "What took you so long?" asked Lady Scarlet as the foursome finally entered. She was looking at her reflection in a large mirror and spoke without turning. "Don't tell me. Let me guess. You were admiring the magnificent Jacobean staircase out there weren't you?" she continued. The foursome looked at each other, then back through the door they had just come through. They immediately noticed there was indeed a very ornate and elegant curved staircase in plain view. "How on earth did we miss noticing that?!" they all thought at once. Jacobson, still thinking about his history lesson, was suddenly taken with an urge to be factual. "Actually," he began. "we were talking about medieval methods of ... ouch!" Ethyl's right elbow dug itself into Jacobson's boney rib cage with so much force that the old man almost rattled. "Er ... couches!!" Ethyl rapidly interjected. "We were talking about medieval couches." Lady Scarlet turned from the mirror. An extremely puzzled expression was on her face. "That's strange, I haven't got any medieval couches." she said. "I only have a Jacobean staircase." Everyone was dead silent for a minute, except for Jacobson's creaky knees the moth that liked to flutter in and out of his weathered clothes. "Let us get down to business, shall we," Lady Scarlet went over to her white ivory desk and pulled out a book from one of the top drawers. "this might help you break the witch's cure." "What was taken from her? No one seems to know." Ethyl took the leather bound book. "It was before my time you see," Lady Scarlet began, "when my Father ruled over this town. There was a horrible plague brought in by rats over seas.....no man, woman or child was safe. My father watched as people dropped dead all around him like flys........so with no other options left he went to the Witch to cast away this terrible sickness. I believe the woman's name was Sorrow Roseflower." Ethyl carefully opened the book to random page. "Two mint leaves, one frog leg, a cup of coal, a pot full of bog water? This sounds like the worst recipe book ever." "That is no recipe book you hold in your hands, that is Madam Sorrow's old spell book." "I do not see how this is going to help us....none of use can use magic." Rodrick look over Ethyl's shoulder. "I have given you this book to help trake down what was stolen. Please, let me explain its purpose by finishing the rest of the tale." Lady Scarlet turned toward the large dust covered window behind her desk. "Madam Sorrow somehow rid the town of the plague and time went on happily for years." she turned back to the group gracefully her long veil moving softly. "As payment for her services, my Father gave her the left wing of this mansion for her to live in. Together they made the town bloom into a rich and growing society." "Can we cut the campfire stories short, just tell us where we have to go and what we have to find." Rodrick blurted out as he became broad of the story. "Rodrick!" Ethyl smacked him in the arm "Sorry, please continue." "Oh no, it is quite alright...it is a rather dull part of history in my option. I have been telling it for nearly hundred and fifty years now and I am rather tired of hearing it myself. I have had my men search the contents of her room and came up with nothing..........I don't even thing my father knew what was stolen........however a week later all of the newly buried bodies came out of their graves. " "So every one who dies comes back to life." Uncle Seth rubbed his chin. "At first.......until people started to wake up dead. The smallest injury slowly and eventually ended peoples lives." "Ummm so how did you.......pass on, if I may ask." Ethyl said sensitively. "I pricked my finger of a thorn." "Thats it." Rodrick said insensitively. Ethyl elbowed him without a word. "I know I was rather disappointed myself, Rapid blood poisoning I was told." She chuckled. "But enough about me, I assume you would like to have a word with my father." "Is he still kicking around?" Rodrick said before he could stop himself. Ethyl put a hand over her eyes. "In a sense yes." Lady Scarlet led them to a lager metal door down to the mansion catacombs. The heavy metal door screamed a high pitch note as it slow swung on its hinges. All three live beings in the room covered their ears and cringed. "I am terribly sorry about that, it has been ages since I went and visited Father." "Ha, it is moments like this at I am glad I don't have ears," Jacobson chucked a hallow laugh, that was cut short by a room full of glaring looks. They entered the unlit staircase to the cold underground crypt. The air was damp, very stuffy to breath in. Rats scampered over walking feet. "I can't see a thing." Ethyl whispered walk blindly through a pitch dark tunnel "Oh cool I found a rope to hold on to." "Um .....Ethyl that's my hair your pulling on." Rodrick voice echoed in front of her. "Even better. Now we will stay together. Wait, how did you end up in front of me?" Ethyl remembering the order in which they went in. Lady Scarlet, Her, Uncle Seth, Jacobson then Rodrick. "Since forever." he pointed out obviously. "We are nearing the catacombs." Lady Scarlet voice echoed from deep within the endless darkness. "What can you see?" Ethyl clutched onto Rodrick's braid tightly after something ran across her foot. "Do you remember the time we got lost in the Rat King's Palace. Well this is ten time worse...the rats are literally coming out of the walls and ceiling." Ethyl was grateful she couldn't see what was going on until a furry ball of fur with claws fell and hit her in the shoulder." "Gaaaahhh!" she quickly shooed it off, there was a soft squeak as it bounce off the floor. "Ahhhh-Chhhooo!!" Uncle Seth sneezed. "I am allergic to small rodents." "These rats are not small in the slightest." Rodrick spoke. "Okay please stop describing thing now." Ethyl sounded a little freaked out. Suddenly a soft glow of light rose up from torches hanging on the wall. They were in a high marble high ceiling room. The rats ran away in a wave to all the darkest corners, holes and crevasses they could fit through. Ethyl shivered. Lady Scarlet stood beside a stone tome with a delicate hand on the plain black marble cover. "I need assistance with this for you please." "Gladly." Ethyl stepped over and gave the marble block and gave it a good hard push. It moved an inch but would budge no further. Rodrick laughed. "Step out of the way ladies, this is a man's job." He rubbed his hands together, firmly grabbed the edge, locked his massive arm and nearly threw the poor marble cover to the wall. "WHO DARES DISTURBS ME IN MY GRAVE!!!!!" The skeleton withing the tome sat upright. Scaring Ethyl and Rodrick so bad that the Orc punched the lords head right off his shoulders, his head bounced to the floor. "Rodrick! How could you!" Ethyl punch him in the arm. "That was rude!" "Sorry, it is just in my nature to attack when I am surprised, reflexes! I swear I didn't do it on purpose." the Orc held up him hands. "COULD SOMEONE PLEASE PICK ME UP OFF THE FLOOR!" The Lord's head yelled in anger. Lady Scarlet rushed over to where her father's head had come to rest and swiftly picked it up. The next instant she just as swiftly dropped it again. "Ouch!" winced her father's head. "Er ... I think His Lordship's bonce may have rolled into the rats' communal poo corner." suggested uncle Seth. Lady Scarlet sniffed the slimy, gooey rat turd now smearing her hands. Immediately she recoiled them from her face in disgust. "Eeeugh!" she cried once more. "WILL YOU PLEASE STOP SAYING 'EEEUGH' AND GET THIS CRAP CLEANED OFF ME?!" yelled her father's skull. "Here. Use this." said Jacobson, holding out his old neck-scarf to Lady Scarlet. "It'll save you soiling your petticoat." Lady S took the scarf and, holding her dad's dome at arm's length, started wiping it clean. As she did so, Jacobson elbowed Rodrick to get his attention. With a grin he whispered in Rodrick's ear. "Makes a change to watch the nobility getting themselves smelly and mucky for once, doesn't it?" To Jacobson's surprise his huge companion's demeanour became suddenly stern. Obviously the Orc Prince wasn't in the least amused. After ten minutes of exaggerated grossed out noises, Ethyl finally took the Lord head in her hands, shook it twice and placed it back on his spine with a gentle snap. "Sorry Lord, Sir, but we came here in hopes that you could help us figure out what happened to make your town....ahhh literally a dead town." Ethyl said politely to make amends for the horrible introduction. "I SPECIFICALLY ORDER THAT I WAS NOT TO BE DISTURBED..."
"Father please, you don't have to shout we can hear you just fine." Lady Scarlet sat next to him on the end of the tone. "WHAT?" The Lord shouted at his daughter. "I SAID, YOU DON'T HAVE TO SHOUT WE CAN HEAR YOU JUST FINE!" Scarlet piped up. "Sorry but I think my Father hearing isn't as good as it use to be." "WHAT DO THESE LOT WANT!! I HOPE IT WAS MORE THEN TO THROW ME AROUND!!!!" "WE ARE TERRIBLE SORRY ABOUT THAT!!!" Ethyl yelled. "WE HAVE COME TO HELP FINE A CURE FOR YOU TOWN'S CURES!!" "WHAT?! STOP BOTHERING ME!! IF YOU WANT TO MAKE YOURSELVES USEFUL HOWEVER, TRY FINDING A CURE FOR MY CURSED TOWN!!" Ethyl threw up her hands in surrender and sighed. "SCARLET SHOW THEM THE MAGIC MIRROR!!! DAMNED THING HAS BEEN ACTING UP AGAIN!! IT SHOULD HELP IN FINDING SOME ANSWERS!" "Of course why didn't I think of that before." Lady Scarlet jumped off her seat. "WHAT!?" Her father answered back. "RIGHT AWAY FATHER!!!" Scarlet pulled back a curtain on the opposite side of the room they had just came in. A clear lengthy mirror glistened in the torch light. "Magic mirror huh? What is so special about it?" Rodrick folded his arms. "It is more of a portal to the past... however as you can see there has been a piece of glass missing so using it is very dangerous." In the bottom left corner a sharp triangular shape of glass what gone. "Looks like someone smashed it." Ethyl pointed out. Uncle Seth approached the mirror to take a closer look. Using his thumb and forefinger as a gauge, he seemed to be estimating the area of the missing triangle. "I'd say we're looking at less than 2%." he said after a moment's thought, then added, "Such a small amount of damage will probably only marginally affect the mirror's functioning." After he had paused to blow some dust off the top of the mirror uncle Seth continued. "Yes sir-ee. I've known these things to work with around 10% damage; and to the central part, not just the corner." Ethyl looked on dumbfounded. It seemed there was a side to her uncle of which she had been completely unaware. "How come you know so much about magic mirrors uncle Seth?" Ethyl asked when he rejoined the rest. "Oh, it's just something the first Mrs Harrison got me interested in - back in my trippy-hippie days." Seth explained, whispering in Ethyl's ear. "... but don't go saying anything to your auntie Jasmine about any of this will you?" "I told her I'd quit dabbling in magic and ... er ... 'stuff' ... once I became a forest ranger. Mum's the word, eh?" Ethyl felt the pain Seth was suppressing, in spite of the fact that he smiled as he winked at her. Feeling unrestrained (albeit temporarily) by his promise to his wife, Seth felt justified in assuming a leadership role in the situation. "OK. Listen up everybody." Seth said in his most assertive voice. All eyes were on him. "First thing we need to do is take this mirror ..." (he points to the mirror) "... into the heart of the town." "It needs to be placed as close as possible to where the curse we're dealing with is strongest. If conditions are favourable, the mirror will act as a portal, drawing off the evil spirits." Rodrick looked puzzled. "What do you mean ... 'if conditions are favourable' ... ?" he asked. "Basically ... what we need is ... the light of a full moon." Seth answered (as if thinking aloud). "But ... as this world has three moons (as well as three suns) we shouldn't have to wait long for a full one." Seth stopped thinking aloud and looked everyone in the eye in turn as he continued. "It's a long shot, but as I see it it's like this ... what have we got to lose?!" "Well, what are we waiting for?" said Jacobson, standing up and brushing away a moth that was wandering around one knee of his trousers "Let's grab the mirror and high-tail it out of here. This place gives me the creeps anyway." "Count me in too. I've absolute faith in you, uncle." seconded Ethyl. Lady Scarlet and Rodrick looked at each other before nodding their agreement. "Thank heavens for that!" sighed the old Lord's corpse (while making himself comfortable laying back in his coffin). "Now. If the big fellow will kindly cover me (his lordship nods in the direction of Rodrick then at the black marble cover) ... I really must get back to my beauty sleep!" Since Jacobson's arms were to frail and would fall off on a whim, Lady Scarlet has yet to ever do any manual labor and poor Uncle Seth's arm had yet to heal, Rodrick and Ethyl were the last and only able bodied beings left to do the job. "So how are we going to do this? This is a big mirror." Ethyl took a step back. "I hope it isn't too heavy"
"Come on, the faster we move this thing the faster we can leave." Ethyl grabbed one side of the mirror and waited patiently for him to help. "Fine! but if it breaks I will not take the blame this time." With that they lifted the magic mirror off the wall and gently set it down upright on the floor. "What do you mean 'this time'? Wait, what did we break last time?" Slow they tilted the mirror on its side so the top would not touch the ceiling in the staircase. "You don't remember the time we had to move my father's old bust from the throne room to the attic...it was twenty-thousand steps of winding hell. Then just as we got to the top of the stares it wouldn't fit through the door way, you dropped your end and one of the ears broke off the bust.......and what did you say as my father walked in." "Ummm....... now it fits in the door way.....?" Ethyl couldn't recall her own words. "You said 'It looks better this way.' My father was so furious he then made us move the new bust of him from the attic to the thrown room...." Rodrick chuckled. "actually it was, how you would say 'priceless' to see the look on his face." With Rodrick leading down the cold hallway back up to ground level he chuckled the whole way talking about all the things he use to do to purposely peeve his father. "Jeez Rodrick, you were really a rotten kid." Ethyl huffed and they carefully maneuvered around the sharp corners. "What are you talking about? I left spoiled milk in his boots a week before we started our journey." "I repeat my late statement, you are still a rotten kid...even in your 30's"
Rodrick broke out into a throaty laugh and didn't realize that they were standing in Lady Scarlet's large office. "Sweet we are half way there. Lets take a small break." That is when they saw everyone sitting around a elegant table having tea. "Hey guys good job, looks like everything made safe and sound." Jacobson cheered. "Hey wait how did you all get here before us?" Ethyl frowned. "There was another secret passage out of the catacombs, there was even a lift." Jacobson took a sip of tea and everyone watched the liquid spill onto his boots. "So we could have taken the lift, instead of dragging this thing up the stairs!" Rodrick snapped. Lady Scarlet, Uncle Seth and Jacobson all looked at each other. "I apologize my friends, it slipped my mind, you were off before I could tell you." "Yeah, what is the big deal anyway the thing made it in one piece." Jacobson chimed. "come sit down and rest. After wiping the sweat for her brow with a tired sigh, Ethyl looked at Rodrick and said. "I know one thing that isn't going to leave this room in one piece." Rodrick huffed in agreement. When afternoon tea ended Lady Scarlet summoned some towns folk to help move the mirror the rest on the way. It was carefully place on the back of a hay covered wagon pulled by a undead horse. For a moment Ethyl pondered on how this creature was able to see with no eyes when the horse turned its head and put it's noes in her opened hand. Later she learned that the horse's name was Bandit. He was not named that because of his odd fur coloration but because of his tendency to steal and chew on shiny objects. She was warned to watch any jewelry she might be wearing. Ethyl just chuckled. In a few minutes they reached the middle of town and everyone gathered around. It was an eerie sight when all of the town children and pet dogs mingled with their families and were completely silent. "Now is the time to step through the mirror while it's magic is at it's strongest." Lady Scarlet spoke to the group. "I'll go first since I am dead already, just encase something goes wrong......I couldn't possibly die again...could I?" Jacobson pipped up. He wanted show his bravery, especially in front of Lady Scarlet. "Oh and here Ethyl you almost forgot this. May it help you more then it helped us." Lady Scarlet handed Ethyl the old spell book. "Oh yeah! Forgot were I placed it." She chuckle a nervous laugh. They group lined up. "Uncle I am not sure you should come with us on this mission." Ethyl turned to Uncle Seth, his arm was still in a sling. "Nonsense! I can still be of use." He frowned. "You should go and rest. Don't worry about us, we have been through worse." "Fine! But if I think you are in trouble then I am going in." Jacobson jumped through the mirror first. It rippled as it closes around him like water. Everyone waited for a moment. Jacobson did not return nor did he show up on the other side. "Do you think it is okay to go now?" Ethyl paused for a moment. "Only one way to find out. " Rodrick said as he picked Ethyl up in his arms and stepped thought the time portal. The glass was not cold as they passed through but warm like a light breeze. On the the silver side of the mirror the town square was alive with green grass, the laughter of children and music playing off somewhere in the distance. Completely opposite from the town they had just left behind. The sun shone brightly with out a cloud in the sky and birds were chirping in the trees that once where never there. "So what now?" Rodrick put Ethyl down. "Well the Manor seems to be good place to start." Ethyl looked around. "Where is Jacobson?" "Who knows, maybe his legs fell off on the way here." Rodrick teased. Out of nowhere a man wearing a bright red long coat and a long red beard to match started to skip in circles around Ethyl and Rodrick laughing and cheering. "I AM ALIVE!! I AM ALIVE!! MY GUTS ARE IN PLACE. I AM ALIVE!! I AM ALIVE!!" The man did a jig before picking up Ethyl and swung her around. "Oh Ethyl this is like a dream come true! I live and breath again!!!" Both Ethyl and Rodrick was surprised at Jacobson transformation, however Rodrick soon became moody after Jacobson twirled Ethyl around again. "Ahem!!" "Oh YES! RIGHT! The mission!" Jacobson took no notice of the Orc's hard expression. "What am I wearing?" Ethyl took note that her clothing had changed to match the time period. She wore a long tan colored dress with and white apron with her short hair tide back in a bun. "I believe it is some sort of cook uniform." The lively Jacobson spoke up. "And him....well I think he is a servant." "Servant?!" Rodrick boomed. The Orc looked down to find he was wearing gray pants held up by a rope belt and a itchy ragged short sleeve shirt. He walked the streets bare foot. "I will tear the head off anyone who orders me around!" He frowned. Ethyl laughed, Jacobson however dared not to say anything. Jeez Danielle, another witty, imaginative and humorous post. Well done you for holding the fort (so to speak) and for maintaining the excitement of our heroes' adventure. I sorely need to somehow kick-start my imagination. Hopefully I will come up with something sooner rather than later. In the meantime maybe I could make a plea to ask if anybody else here wants to jump in at this point and add their two penny (or two cents) worth? "Wait here. I'll climb that tree over there and have a look what's around." So saying the old man thrust his walking stick into Rodrick's belt (for safekeeping) and bounded off towards the nearest tall tree, cartwheeling as he went. "Show off!" thought Rodrick, and he rolled his eyes. "Here. You look after this." Rodrick said to Ethyl, taking the walking stick from his belt and holding it out for her to take. "No way." Ethyl said folding her arms defiantly. "Looking after stuff is the servant's job - I'm the cook." "Hmmff!" fumed Rodrick. "Just wait 'til I get out of these clothes and into some that suit my royal station." The orc fumbled awkwardly, vainly trying to get the walking stick back under his belt. He was getting more and more annoyed. "Mark my words." he was saying. "There'll be NO insubordination once I'm properly attired. No siree. Heads and bodies WILL part company!" Meanwhile, Ethyl wasn't paying the slightest bit of attention to Rodrick's tantrum. "Oh dear. I do hope Jacobson doesn't over-exert himself." she kept saying to herself, her face betraying an uncustomary anxiety. Soon the old man was at the very top of the tree. He swung gently in the breeze, scouring the surrounding landscape for signs of the manor. "Confounded walking stick!" Rodrick yelled in frustration. He was wondering whether or not to toss Jacobson's walking stick into a nearby bush. But before he'd come to a decision a loud 'BANG!' rang out. Seconds later Jacobson's body was seen to slump backwards. He fell to the ground, crashing from branch to branch as he did so. "Oh my God!" Ethyl gasped. "What the fridge!" gasped Rodrick. They looked at each other. Was it safe to go to Jacobson's aid? Apparently, this wasn't such an idyllic place after all. "Jacobson?" Ethyl said poked him with a long stick a safe distance away. He grumbled something she couldn't make out until she got closer. "sooooo...mucchhhhh...paaaaiiinnnn....." Jacobson was laying face down in the dirt. Just then a teen age boy ran up to them in a panic holding a musket awkwardly in his hands. "I am sooooooooooo sorry!!!" the dark hair boy was nearly in tears. "I did not shoot him on purpose I swear!!" "What are you doing with that gun in the first place is what I want to know?" Ethyl scolded him. "I was practicing for the Royal wedding Miss." the thin boy was dressed in a royal blue suit with shiny golden buttons. A shiny belt (that held up his over sized cloths) had a cutlass at his side. "Are you apart of the gaurd or something?" Rodrick remarked. "Yes Sir!" The boy held his head high. "I took my father's place after his death. It is a great honour to be give be the king." "How old are you... ummmmmmmm?" Ethyl asked. "I am Leland Claude Hodowanitz III. I am going to turn 16 the next fortnight." He said proudly. "So then the plague did sweep through here already, since the king is resorting to hiring children." Rodrick piped up. "Hold your tongue stable rat! Our empire is still standing, and one day I will be captain of the gaurds." "Ummm would you mind helping us then, if you don't mind." Ethyl butted in before Rodrick was able to unleased his furry on the poor boy. "We are new to the area, could kindly show us anround......oh and finding a healer for our friend." Ethyl near forgot Jacobson until he moaned. "Forgot how much I hated the feeling of paaaiiiinnnnn!!!" As he tried to roll over. "OF couse at once!!!" The lad stood at attention. "My Grandmother can help heal his gunshot wound, and if he dies I can go call my Uncle who is both the gravedigger and city executioner." He said with out missing a beat and a smile on his face. "You have a pretty interesting family there." Ethyl said neviously. "My Grandmother is also the King's head cook, she is looking for cooks to help perpare for the weddign feast at the end of the week.." he pointed to Ethyl. "Yeaaaaaahhhhhhh for me." Ethyl said weakly with a small smile. The lad gave her a wink and took it as a compliment. He was doing his duty to help the city and its citizens. 'Wedding feast.' thought Rodrick, his mind conjuring up images of plates overflowing with steaks and pies and goblets overflowing with ale and wine. The orc tried to put on as dignified an air as he could while barefoot and wearing the garb of a stable hand. "Er, tell me master Haddockfish ..." Rodrick started. He was immediately interrupted by the boy. "Ho-do-wanitz! ... Leland Claude Hodowanitz ... the third!" "Ho-kay." Rodrick breathed. "Well, tell me master Ho-do-wanitz ... This wedding feast. Would I ...?" Once more Rodrick had to stop while the boy interrupted. "The third ... the name's 'Hodowitz the Third' ... without the hyphens ... and WITH the ordinal." he sighed." Must I always spell things out to people of your class?" Rodrick's face reddened visibly. He was rapidly coming to the boil. Ethyl and Jacobson looked at each other, holding their breaths in helpless anticipation. But the explosion they feared didn't come. "However, you may call me 'Claude'." the boy suddenly added with a grin. "I was just joshing with you. You should see your face!" The release of tension was instantaneous. The youth continued. "And, for your information, there are no different social classes here. Things like that were abolished decades ago. Everyone will be going to the feast. Whatever their status." "Hmm? That's as may be ... Claude," Rodrick responded questioningly," but I'm surely NOT going to a royal wedding dressed like this" he held up the ends of the rope holding up his trousers. "and barefoot" he wriggled his toes. "Don't worry." said Claud. "I'm sure we'll be able to find an oversize army uniform and some boots to squeeze you into somewhere." Rodrick thought for a moment. "Make that a tailor-made uniform with gold epaulettes and a Napoleon Bonaparte hat and it's a deal." he haggled. Claude looked confused. Ethyl and Jacobson shrugged. "Ha ha." Rodrick boomed out laughing. "I'm just joshing with y'all." "So .. . how does this sound? A single breasted tunic, a pair of knee high boots, some stripey tights, a sword ... and a leather cod piece?" Claude whistled a tune as he led the trio through a maze of vegetable stands. The crowds were buzzing with activity, setting up bright colored banners and baking enough food to feed an army. Ethyl found it hard to believe that a plague had just swept through the town months before. Jacobson though a little pale, was a trooper. He gave Ethyl a weak smile when she asked him if he was okay. "Here we are, my grandmother's shop." Claude propped his gun against his shoulder. "I will go and get her." The boy quickly rushed into the stone building attached a ways away from the castle itself. Smoke left a thick cloud from the chimneys. Just then a booming voice echoed from inside. "I HAVEN'T THE TIME TO DEAL WITH PETTY CIVIL SQUABBLES. I GOT A WEDDING FEAST TO PREPARE!!!" a short stout woman stepped out of shadows, her black curly hair pulled into a tight bun was frazzled and standing up in places. Flour and batter caked the front of her apron, and she smelled of freshly baked apple pie. Ethyl's stomach grumbled. "We were told you could help with our companion's bullet wound." Rodrick spoke first. "Alright lets have a see, lad." she gripped Jacobson's wounded arm, pulling up his sleeve as she did so. "This is nothing more then a scratch, you will live." "what a relief, glad to hear i am not going to lose the arm." Jacobson breathed. "you will if you don't stop moving." Claude reemerged after his grandmother had finished patching Jacobson up with two hot cinnamon buns. "Ack, you sneaky boy, that better all you've eaten." "Yes Gran. Can I bring one for uncle?" "Yes, yes, and tell him to come by, I am running low on fire wood." "your grandson has informed me that you are looking for extra hands in the kitchen." Ethyl announced . "I am not looking for just any help I need bodies with talent. You think you got what it takes to cook for royalty?" "Her roasts are not too bad...but her pies need improv...." Rodrick butted in but Ethyl stomped on his foot to quiet him. "I am willing and ready." Ethyl smiled. "What exactly is the plan?" Jacobson whispered as Claude's grandmother went to check whatever was cooking in the oven. "Divide and concur," Ethyl breathed. "each of us will pick a different part of the castle and gain information. Each night we will meet up and exchange what we have learned, we don't have much time.. I will work in the kitchens.Jacobson see if any of the villagers know anything and Rodrick you should hang around the town guards." "Now you are speaking my language." Rodrick laughed. "And please remember not to draw to much attention to yourselves." Just then a man equally as tall as Rodrick strode toward them, dressed in a dark cowl, black short sleeve tunic, he carried a unearthly sized axe in one hand and a half eaten cinnamon roll in the other. The points of his axe shone eerily in the sun. As he walked by he gave Ethyl a wink with one of his baby blue eyes. "Ahhh there is my son, boy I am running low on fuel for the ovens, be a dear and fetch some more wood." The mountain of a man gave a nod and strode away around back. "That is your son??" Nearly everyone's jaw dropped in shock. "What you feed him a horse a day as a child??" Jacobson shrieked. "That's my boy, Armond Roseflower." Ethyl gasped under her breath "That's Lady Sorrow Roseflower, she is the witch..." she whispered to Rodrick. "We have to be on our guard now more then ever." Ethyl patted a final glazed cherry into the stripe of icing sugar that topped the final cinnamon bun. She stood back and admired her handy work - another nine hundred and ninety nine cinnamon buns all decorated in similar manner. "Thank goodness that's done." Ethyl said under her breath. "Funny thing to serve at a wedding feast if you ask me though." "Ah! That's where the witchcraft comes in." It was Jacobson who spoke, coming up unexpectedly behind Ethyl and making her jump slightly as he did so. "Oh, it's you." Ethyl said as she was about to lick the remains of the icing sugar off her fingers. "I wouldn't do that if I was you." Ethyl stopped. "I'm not sure about the icing sugar, but them there cherries are laced with a magic potion for sure." "What do you mean?" Ethyl asked. "It's a potion to make the peasantry think they've eaten the same as the gentry. Saves a fortune on roast pork and roast beef. The spell wears off by next day but by then nobody can remember the sticky bun - just the roast pork." "Oh those poor peasants." Ethyl gasped. "Well, it's either spiked buns or revolution. So maybe imaginary feasts are better than no feasts at all." Before Ethyl could question Jacobson further Rodrick appeared. He was wearing a rather tight fitting black uniform. He had come from the guard room where he had been privy to what the guards were saying. "Ah, there you are." Rodrick said with a tone of urgency. "I have discovered something of the greatest importance." It was unusual to hear Rodrick speak in such a tone of voice as this. Ethyl and Jacob fell silent as Rodrick continued. "A small sector of the guards are planning a coup. They have bribed the witch to make two spells, one that will turn the peasants into automatons, the other to delude the royals into believing they still have a kingdom to rule." "Are you sure?" asked Jacobson. "No doubt about it." said Rodrick. "I read it in a dossier someone had accidentally left on his chair after their meeting. Here it is." Rodrick pulled a file marked 'SECRET' from under his tunic and placed it on the table in front of Ethyl. She picked it up and quickly scanned through it. "But how will the leaders of the coup benefit if everyone is under one spell or another?" asked Ethyl. "It's all in there." Rodrick explained. "It says the town we are in is built on land that is rich in valuable minerals. It's the minerals they are after. Once they have entranced the people - royals and peasants alike - they will be powerless to stop the destruction of the city and the plundering of its minerals which will follow." Just as Rodrick finished speaking the door to the kitchen burst open. It was a contingent of three of the castle guards. "That's the man, and there's the dossier." cried their leader. "Seize him ... and those two!" The Orc and his two friends looked at each other. "Three against three." Grinned Ethyl. "I like those odds." Half a second later she had leapt up onto the table and was pelting kitchen knives in the direction of the now startled castle guards. As the guards retreated under the hail of utensils Rodrick leaped to the chandelier. He swung til he estimated he could land his huge body on top of them and then let go. Moments later there was the sound of skulls cracking as the orcs massive hands dealt with one head after another. "High five!" Rodrick whooped. "High five!" echoed Ethyl and Jacobson. The guards heard nothing - they were soundly unconscious. Around the stroke of midnight, the trio hid behind the dense rose bushes in the royal gardens. Clutched in Ethyl's hands was a sack of cinnamon buns, Rodrick had the maps and log books of the castle from the royal guards, and Jacobson was eating a sandwich. "Okay" Ethyl whispered when the coast was clear, "here's the plan. We are going to plant the sweets in the guards quarters. This will give us time to sneak inside and look around." She read a schedule logbook by moon light. "Seems we have ten minutes to get through the servant doors on the side, and go out through the main hall to get to our main objection point in the west wing." "Say we get to the witch's room," Rodrick took a look at the map "what are we going to hope to find?" "Any answers to help point us in the right path. I am hoping it will be the cause of the curse, but if not; taking any spell books that help in the matter is our best shot." Jacobson sat silently, chewing his meal. "Most of the guards are asleep already, its just the graveyard shift we have to deal with right now." Rodrick paused. "Red, your going to come with me." Jacobson choked on a bite. "I think this is a suicide mission, I mean; if we get caught..... we are going to have executioner visit us in the morning." He rubbed his neck. "Don't feel like dying a second time." "If we plan this out perfectly, we will be in and out before the servants even wake." Ethyl scribbled a note and handed it to Jacobson. "Here, just encase you forget your job." He frowned as he read it "All this says is to follow Rodrick's orders and to run if we get caught..... "
"The guards are about to switch over now; are you in or not?" Rodrick and Ethyl chimed simultaneously with stern looks on their faces. "Fine." Jacobson gave in. "this is still a bad idea." "How else are we going to solve this puzzle." Ethyl handed Jacobson a log book. "Good luck guys. see you back at the stables in half an hour." Ethyl alone slide from shadow to shadow down the a length wall, dodging a sleepy eyes foot solider and a few maids turning in for the night from their duties. Now was her chance to turn down one more corridor, or was it two more? Ethyl took a second look at her small fastly drawn map, it was badly smudged and crumpled when she hastily last time she put it in her pocket. She had successfully entered the castle with little room for error, now was crunch time she had to move or be caught. Wishing she knew the way, she crept over to peek around the corner. With a quick glance she spotted two guards posted on ether side of the door to the East wing. Fast asleep they clutched half eaten sweet rolls that Rodrick and Jacobson planted. With a smile Ethyl made her move. Swiftly she was gone like phantom to the Witch's quarters. "Do step forward out of the shadows my dear." croaked the witch, without turning away from the cauldron she was stirring to look at Ethyl. "Nearly ready. It's a new formula I'm concocting." Ethyl's hand clutched the handle of her dagger as she cautiously approached the shawled figure of the old lady whose back was turned toward her. "I've been expecting you. 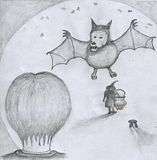 It never ceases to amaze me how no one ever notices the bats in the rafters of this castle." As the witch spoke one of the numerous black marks on the wall of the room broke away. An ominously familiar shape took flight across the room. Moments later the bat and Ethyl were face to face. The bat's red eyes glinted eerily into Ethyl's as it hovered before her. She noticed the critter's mouth, and the vampiric quality of its razor sharp canine teeth. "You're lucky. They've just been fed." said the witch - unreassuringly. Ethyl looked at the other black marks on the wall, many of which were now writhing about in ominous ways. "OK." said Ethyl (deciding to take the bull by the horns). "As you know so much, presumably you also know that what we want is for you to retract the curse you placed on the townsfolk." "Oh my dear." said the witch. "Of course I know. And to be honest, to be able to remove the curse would be my dearest wish too - if only I had it in my power." "You see, the remedy - or cure for the curse - is in two parts. I only have one, my twin sister, Imogen, has the other." "Well," said Ethyl, "tell us where your sister is and we'll find her and bring back the other part." excitedly, feeling at least that now there was more than a glimmer of hope. "Unfortunately," continued the witch, "my sister is ... er ... " she paused, as if searching for words to explain with, "you see Imogen ... my sister ... is ... on another world to this. " "To make matters worse," the witch continued, "it's a world that's in a different dimension - maybe even a different space-time - to this world here." Ethyl suddenly (and unexpectedly) cheered up once more. An idea had instantly struck her. "But, we have a mirror that might help. A portal. It's a bit broken, but maybe it will do the trick for us." "Oh, do you really think so?" said the witch, a tear emerging from her eye and running down her cheek. Witches, it seemed, were more 'human' than Ethyl had realised. Ethyl placed her hands reassuringly on each of the witch's aged and hunched shoulders. "Wait here," Ethyl said, "while I go and look for Rodrick and Red - and the mirror." She turned to go. "Oh ... and be sure to keep your bats well fed in the meantime!" "I gotcha." said the witch with a wink (and sounding uncharacteristically 'cool'). "Oh ... and the name's Rosamund if they ask. Rosamund Rathbone. Atrocious aliteration isn't it. Just saying." "What's in a name?" answered Ethyl, "I'll just say 'Rosie' and leave it at that. OK?" The bat's red eyes glinted eerily into Ethyl's as it hovered before her. Ethyl swiftly made her way down to the guards hall in search of the others. Hugging the wall she thought of the mirror... where was the missing piece located? Its last location was in the old kings tome. Making a note to take a look in the castle dungeons for and clues. Thinking the plan was compromised she scouted ahead, peaking her head around the slightly opened doorway. A few guards sat hunched over a table.... an other sprawled out on the floor with bits of a broken vase littering his hair. "SHHHHHhhhhhh!!!!" A sharp shush scared her up the wall as she made her way around the passed out guards. Rodrick sat by candle light digging through records and scrolls at a desk hidden by a cloth hall portioning. Which looked more like the guards cloths line as it was covered in tunics and socks. "Why didn't you use the signal?" Ethyl angrily whispered. "I can't whistle......" he said plainly. They stared at each other for a few awkward seconds. "Where is Red?" Ethyl looked around to change the subject. "Annoying as he is, No. But he was captured by the Executioner.... well more like borrowed for entertainment preparations for the wedding I imagine." "Why would Armond be up and about at this hour?" Ethyl asked suspiciously. They both stopped and sharply sprung to action. "Oh god he's going to kill Red!! Why didn't you save him?" they sprinted out of the room. "I didn't want to get caught." Ethyl rolled her eyes, "Oh while we are heading this way we need to take a trip to the dungeon. We have to find the missing pieces to the mirror to reunite the witch sisters Imogen and Rosie for them to stop the curse from happening"
"We don't have to move that accursed mirror again!" Ethyl ignored him, "hope Red is down there too..... I am starting to think we maybe in over our heads with this mission." She sighed. An eerie feeling crept over them as they stepped in front the dungeons iron doors. "Only one way to find out...." Rodrick said as he pushed the door open with all his strength.